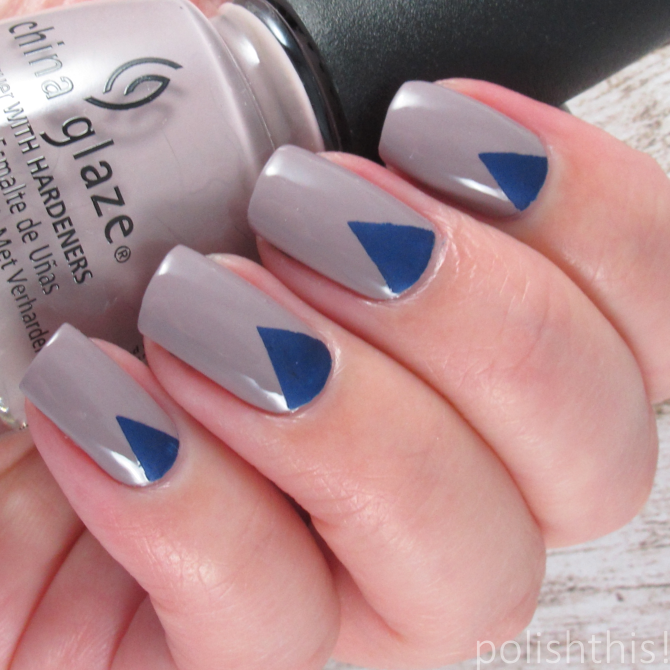 China Glaze Fall 2016 Rebel Collection - Combat Blue-ts and Dope Taupe - Polish This! Hi guys! Today I wanted to share couple China Glaze polishes with you guys for a change. It's been quite a while since I've bought any China Glaze polishes, but while I was ordering online few Essies that I couldn't get from the stores here, I added couple new China Glazes from the fall 2016 collection to my order also. These two really triggered my interest and I thought it would be fun to try them out! I'm going to share my swatches of the two with you as well as this simple nail art look that I did with both of them that you can already see in the first picture. But let's get to those swatches first! 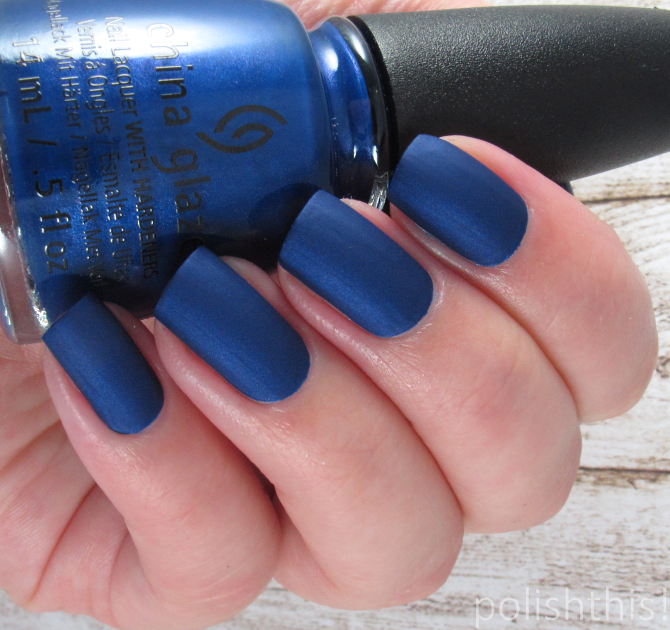 China Glaze Combat Blue-ts is a beautiful royal blue matte with pink and blue shimmer. This dries really really fast, so you have to be very quick applying it. It's opaque with just one coat, but I had to use two as I wasn't quick enough with my first coat and I needed to smooth it out a bit. It's really beautiful color, but I wasn't the biggest fan of the formula and I still don't really like the brush too much either. Also, frankly, this one smells quite bad. I of course wanted to see Combat Blue-ts with a coat of top coat to make it shiny. It's still pretty, but I think I prefer the matte look. It's more unique that way. China Glaze Dope Taupe is a purple leaning taupe creme. It covers with two coats, so that's nice and I really like the color! It's a tad on the thick side so you'll have to be a bit careful applying it, so that you don't end up with too much polish on your nails. But it was still fairly easy to work with, even if I'm still not the biggest fan of the thin brush. I'd say this one is certainly worth checking out! I really wanted to combine these two as they looked really good side by side, so I decided to do some simple nail art with them. 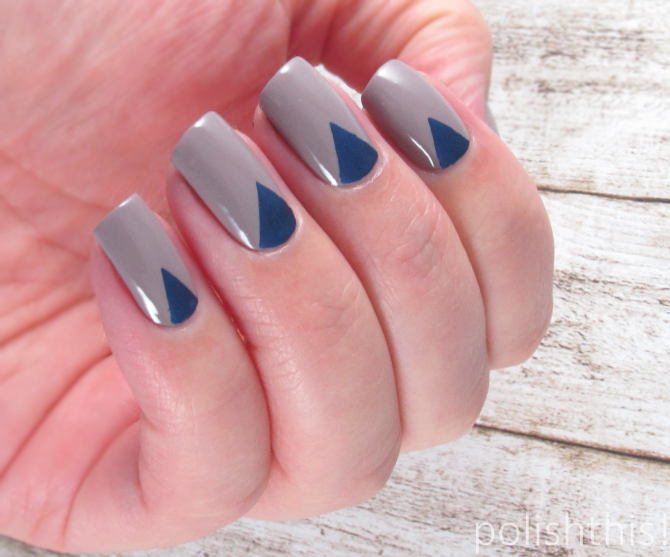 I used Dope Taupe as my base color and then I did just simple triangles using nail vinyls and Combat Blue-ts. What's up with those names btw?! Yeah, I know that the Rebel collection is some sort of 90s grunge inspired, but still... I think those names are just trying too hard. But that's just me, I'm always complaining about these trying-to-be-witty names, most of the times they're just not for me. All in all, this was probably a 50-50 result for China Glaze. I quite liked Dope Taupe, but wasn't so sure about Combat Blue-ts, mainly because of the formula. But it was certainly interesting to try some new China Glazes for a change! Se näyttää kyllä kuvissa todella hyvältä, melkeenpä jopa paremmalta kuin kynsillä! Salamannopea tuon kanssa saa ainakin olla jos meinaa saada levittymään yhtään tasaisesti. Combat Blue-ts is beautiful! I'm not the fan of the brush too. Love the mani! Interesting color. I would definately add some more design on them. It would be looking good with some glitters ( like http://nailartstyle.com/top-60-glitter-acrylic-nails ).But your posts are cool anyway.